We'd all like to know the future and be able to tell what's going to happen to us. 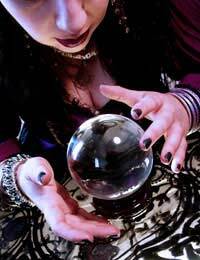 But, in spite of what Nostradamus predicts, or what others will tell you, no one has yet come up with a foolproof prediction system. But that hasn't stopped the scammers from making you believe they have the power. You get a letter in the mail offering to tell your future. It might even be personally addressed and also offer to protect you from evil presences. The letters might even be threatening, promising bad things if you don't respond. Somebody wishes you ill… a harmful person has cast a spell on you… you are the victim of a curse. I had a clearer vision. There is danger - someone wants to harm you! Spiritual powers to remove all problems forever. I can destroy black magic and evil spirits forever. The letter might even contain glowing endorsements from people you don't know, saying that these psychic readings changed their lives. If you send in your money, you may receive some bland, non-personalised predictions - if you're lucky. Much more likely you'll get nothing at all in return. The simplest answer is just not to respond. But if you're tempted, before you do anything, ring Consumer Direct for advice. If you think a mail might be misleading, you can contact the Advertising Standards Authority. You can also register with the Mail Preference Service to stop all junk mail. Above all, remember not to be intimidated by any threats in the letter. There is nothing they can do to harm you. Sadly, if you've paid, there's very little anyone can do to retrieve your money. If you're dissatisfied with what you receive (if you even receive anything), get in touch with the agencies above - Consumer Direct and the ASA. They can follow up and attempt to find the criminals.